Pure launches 'Jongo' multiroom audio range | What Hi-Fi? Reflecting the lofty ambitions it has for its new range, last night Pure announced the intriguingly named 'Jongo' system from the 31st floor of a central London landmark. Jongo is a family of multiroom audio products, able to distribute synchronised audio to multiple devices from a single source. Sources include Pure's 'Flow' range of networked products, as well as a new Pure Connect app for iPad, iPhone and Android. 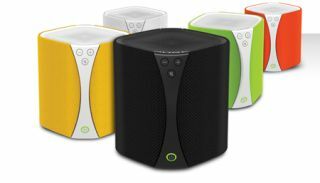 A system can begin with a single product: the Jongo S340B wireless speaker (which features wi-fi and Bluetooth connectivity), at £150. It's a 12 x 12 x 13cm speaker in a choice of colours, comes with a rechargeable battery pack (good for a claimed 10 hours of listening per charge) and features four 3/4in Mylar tweeters in a 360˚ configuration and a 3.5in Neodymium upward-firing woofer. Power is 2.5 watts to each tweeter and 10 watts to the mid/bass driver. There are a choice of audio profiles (stereo foward-facing, mono 360˚, stereo 360˚ and 'outdoor boost') designed to suit a number of different listening environments. The Pure Connect control app allows music to be streamed from personal audio devices, from a home network and from the Pure Music on-demand music service. This last allows unlimited music streaming from a substantial cloud-based catalogue for £4.99 per month. Creating a multiroom system is simple: simply add more S340Bs, or incorporate any of Pure's other streaming products (such as the Sensia 200D or last year's Award-winning One Flow) into the set-up. Pure is promising additional Jongo products in the near future, including a hi-fi adapter (to allow users to include their hi-fi set-up in the multiroom system) and further wireless speakers. The Jongo S340B will be in stores from November, initially in black, white, green, mango and orange. We anticipate a review sample arriving at What Hi-Fi? Sound and Vision Towers before the month is out.